Armenia Fund USA mourns the passing of Edgar Hagopian on March 27, 2011. Mr. Hagopian was 80 years old. Born and raised in Detroit, Michigan, Mr. Hagopian was a pillar of the Detroit Metro Armenian-American community. A businessman, humanitarian and loving, giving person, Mr. Hagopian and his wife, Sarah, devoted immeasurable time and energy giving back, with Hagopian companies alone donating more than $70,000 annually in goods and services to charity. An army veteran, Mr. Hagopian grew his family business exponentially, and the 72-year-old Hagopian World of Rugs and Cleaning Services continues to thrive under his two daughters and son-in-law. Mr. Hagopian espoused an unwavering commitment to galvanizing fundraising support from the Detroit Armenian community. Among his numerous accomplishments, he was instrumental in organizing the Detroit Armenia Fest launched in 2007, with proceeds donated toward Armenia Fund USA projects and to other Armenian charities and causes. To date, more than $25,000 has been raised through Armenia Fest. His pride in and celebration of his Armenian identity compelled him to help pass the 2002 Michigan Public Act 558, which recognized the Armenian Genocide, and in 2006 through the Hagopian Family Foundation, he began the Facing History and Ourselves project to promote Armenian Genocide awareness. The Detroit International Institute inducted him into their Hall of Fame in 2002 and three years later in 2005, Mr. Hagopian received the prestigious Ellis Island Medal of Honor for his unquantifiable dedication to community service, the exploration of his ancestry and for facilitating cultural exchange both in the States and abroad. Indeed, Mr. Hagopian’s generosity of his time, resources and connections knew no bounds. 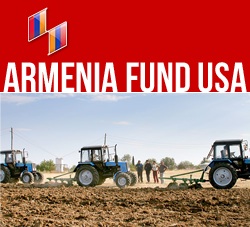 Armenia Fund USA could always count on him to lend the full extent of his support, graciously donating towards organizational projects, serving as an ambassador of the Detroit Armenian community and even hosting multiple visits from the president of Karabakh and other Armenian dignitaries. Armenia Fund USA will forever mourn one of our most cherished. Throughout the time we knew Mr. Hagopian, his hard work, dedication and passion for giving have been an inspiration. His philanthropy and compassion are beyond our individual appreciation, and can be extended to the entire Armenian Diaspora and Armenians around the world. Mr. Hagopian is survived by his wife, Sarah; his sisters, Mary and Ilene; his brother, Steve; his children, Suzanne, Edmond and Angela; and three grandsons, Alexander, Adam and Nicholas.